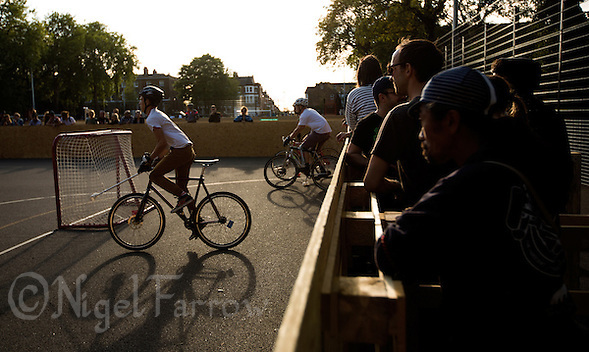 Although cycle polo has been around since the end of the 19th Century the hardcourt version only came into being in the early 21st century. 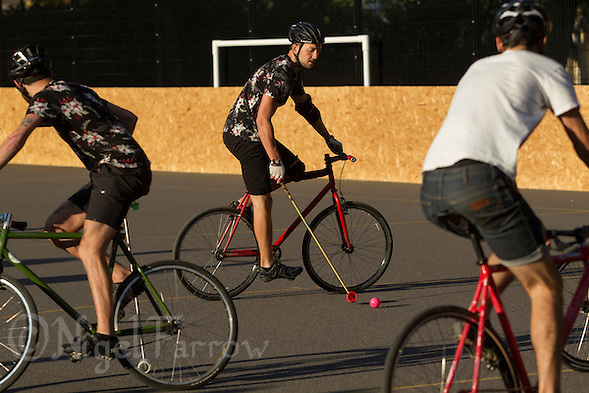 Unlike its older grass based sibling, hardcourt bike polo games are played on existing tennis courts, car parks and 5 a side football pitches with, where possible, boards around the sides to keep the ball in. Other differences include only three players on each team as opposed to six with four on the pitch and, each game is usually limited to twelve to fifteen minutes, though sometimes ten in a tournament to allow for more games to be played, or the first team to score five goals. Games start with the players lined up behind their goals. 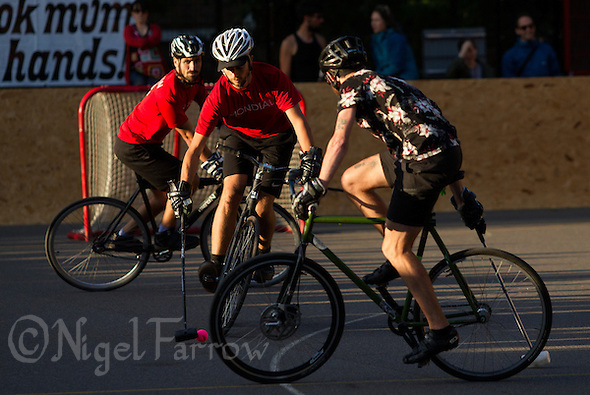 On the signal they charge towards the ball in the centre of the court to win control in what is known as the joust. 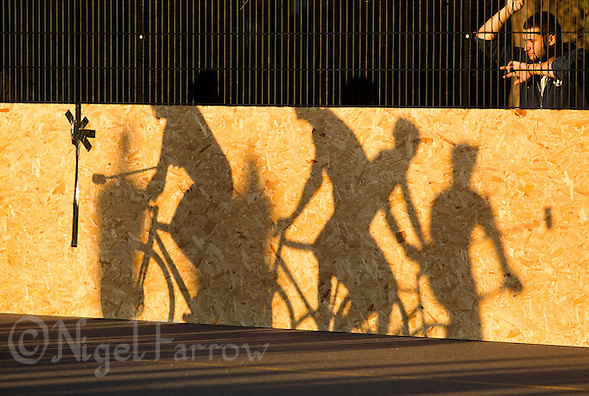 Whilst standard bikes were used in the sport’s early days the advantages of customising them became apparent due to the advantages of shorter wheelbases which allow for turning in smaller spaces and provides less space underneath the frame through which rivals can shoot or attempt to hit the ball. 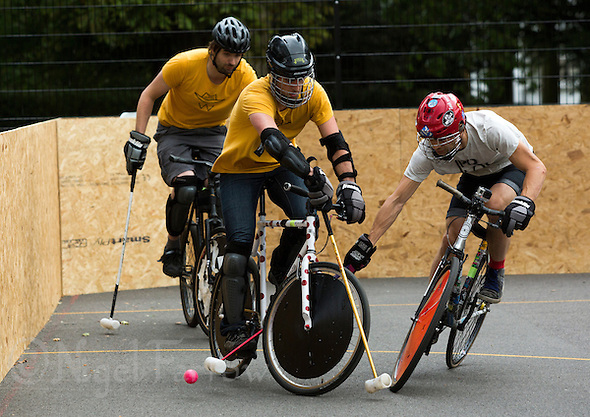 Some players also make wheel covers to protect the spokes and create a surface from which they can rebound the ball during play when making a shot. Mallets were originally hand made but manufactured versions can now be bought. 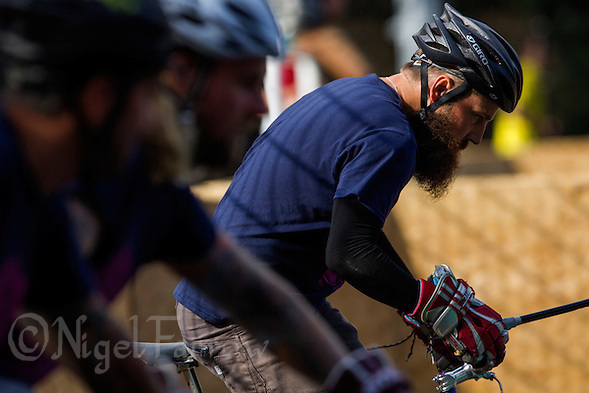 With the need for good manoeuvrability, and the ability to quickly accelerate in the confined space of the court, low ratio, single speed bikes are favoured. 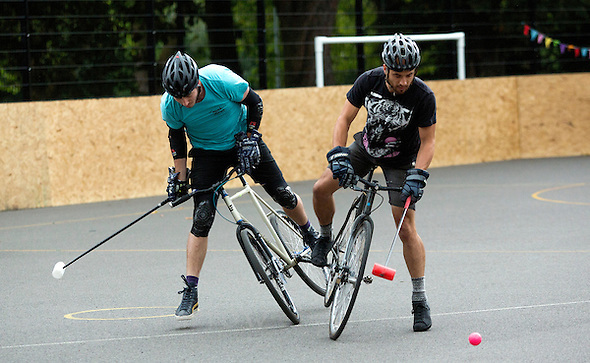 Still in its relative infancy the rules of hardcourt bike polo may vary from city to city and country to country though many are now adopting those devised by the North American Bike Polo Association. 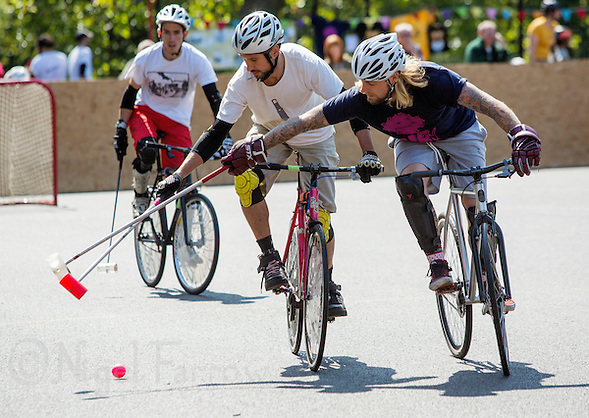 Players are required to stay on their bikes throughout play. Dabbing or touching the ground requires them to tap-out at a pre designated point near the centre of the court avoiding any action that affects play until they have done so. Shoulder to shoulder and mallet to mallet contact is usually permitted whilst the legality of other forms such as hooking, where a player uses their mallet to pull a rivals away from the ball varies depending on the tournament or local rules. 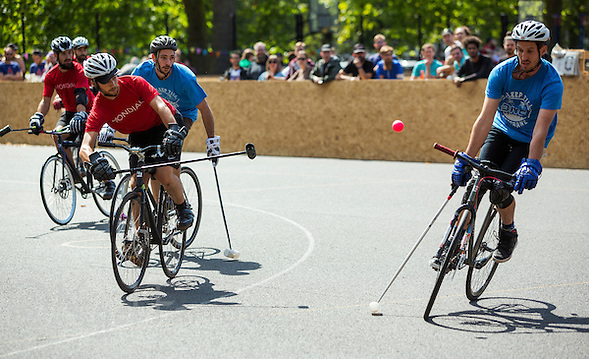 To score the ball must be hit into the goal with the end of the mallet, a shot. If the ball is hit with the side of the mallet, a shuffle, the goal is disallowed. After a goal is scored the scoring team must wait in their own half until the opposing have crossed the centre line with the ball. 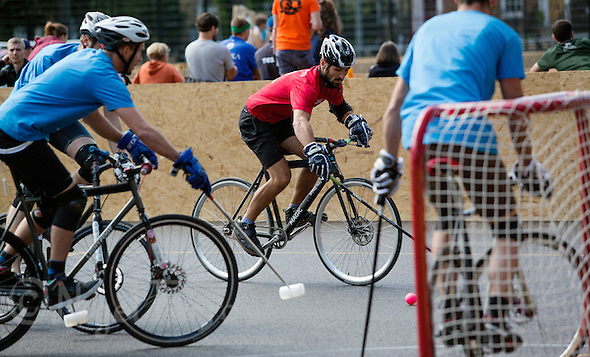 Whilst originating in Seattle in the USA the sport has now spread around the world to now be played in over 30 countries and with organising bodies on North and South America aswell as Europe and Australia. The first world championships were held in Toronto in 2008. Posted on Sunday, August 17th, 2014 at 9:57 pm. 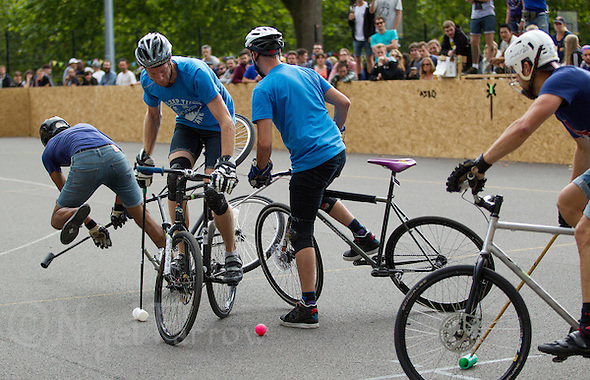 | Categories : Bike Polo, News, Recent, Sport | Tags : bicycle polo, bike, bike polo, cycle, cycling, joust, london open, london open bike polo, sport.